Learn how imaging can be applied to gain early insights into drug efficacy and inform the design of phase III clinical outcome trials in cardiovascular disease. Understand which markers of atherosclerotic disease severity are most useful as imaging endpoints in drug intervention studies. Learn about the emerging role for molecular imaging of inflammation and disease activity in cardiovascular drug development. Many cardiovascular drugs in the pipeline will fail to demonstrate a clear clinical benefit when evaluated in large-scale clinical outcome trials, which are costly, require lengthy follow-up and can potentially expose patients to unforeseen risks. There exists an enormous gap between early mechanistic studies demonstrating proof-of-principle drug efficacy in preclinical models and successful translation of these therapies into everyday clinical practice. To help overcome this challenge, cardiovascular imaging techniques can be applied to quantify early changes in disease severity owing to drug intervention, or lack thereof, with the aim of informing subsequent clinical outcome trials. This approach can be used to direct valuable resources towards development of drugs most likely to provide real clinical impact. The rationale here is that ‘surrogate’ imaging outcomes can be powered using far less subjects than clinical outcomes in drug trials, as each participant will contribute an imaging endpoint regardless of whether they then go on to develop a clinical event. In addition, drug efficacy can be more rapidly tested using imaging markers as there is no need to wait long periods of time for clinical outcomes to occur. Imaging endpoints in clinical trials might also be used in the future to identify specific subgroups of patients who are more likely than others to respond to targeted pharmacotherapies in cardiovascular disease—the so-called precision medicine. Indeed, better methods are needed to identify those patients with cardiovascular disease who are most at risk of future or recurrent, clinical events despite secondary prevention. Many of these patients will have ‘residual’ on-treatment risk and could benefit from higher intensity lipid lowering or anti-inflammatory therapies currently under evaluation in atherosclerosis. Mechanisms underlying on-treatment residual risk are widely heterogeneous and patient specific, with different disease substrates (ie, thrombotic tendency, lipid accumulation and inflammation) contributing in varying degrees to an individual’s future cardiovascular risk. Consequently, applying targeted antiatherosclerotic drugs on top of standard therapies broadly in unselected patient populations is likely to produce at most a modest impact on clinical outcomes. This article will discuss the potential scope of imaging to improve drug efficacy testing of current and emerging disease-modifying therapies in atherosclerosis. The ideal imaging endpoint for use in any cardiovascular drug trial should be easily measurable and highly reproducible, with sound biological rationale and strong prognostic link to important clinical outcomes. Importantly, an imaging biomarker should also reflect and track the mechanism of the tested drug. For example, measurement of plaque lipid content would be an appropriate biomarker for studying lipid-lowering therapies. The relative change in response to drug intervention for an ideal imaging endpoint should also be detected within a relatively short time-frame. Methods for quantification of atherosclerotic disease severity have been comprehensively reviewed elsewhere1 2; here we focus on their ability to predict clinical events. Among the most widely used imaging endpoints for cardiovascular drug trials are arterial inflammation, vascular intima media thickness (IMT), plaque burden (or atheroma volume) and plaque morphology. It is important to acknowledge that any perceived prognostic benefit of surrogate imaging markers, which has been inferred from observational studies, cannot stand alone for drug approval. Moreover, this approach does not account for the influence of confounding factors, including multiple drug effects and cannot replace the need for a prospective controlled clinical trial to test drug safety.20 Exposure to ionising radiation, additional risks associated with invasive imaging procedures and local accessibility to imaging technology are other factors to consider when choosing between surrogate imaging endpoints for cardiovascular drug trials. While plaque volume and composition can be more precisely quantified using invasive versus non-invasive coronary imaging, it is worth bearing in mind that there is also a high ~25% participant dropout in contemporary invasive imaging studies.21 In addition, the concept of an overall ‘barometer’ of disease severity that might be modifiable with drug intervention can be more readily attained using non-invasive than invasive imaging, for example, with PET or MRI, where the entire vascular bed can be imaged simultaneously. Here we discuss how various imaging biomarkers have been applied in clinical drug trials to study the efficacy of disease modifying therapies in atherosclerosis, including both long-established and newly tested lipid-lowering and anti-inflammatory agents. Statins reduce low-density lipoprotein cholesterol (LDL-c) through inhibition of β-Hydroxy β-methylglutaryl-CoA (HMG-CoA (HMG CoA)reductase and have been proven in landmark clinical trials to dramatically reduce the incidence of cardiovascular events in a range of individuals,22 with greater benefit seen for intensive versus moderate or low-dose therapy in patients with stable angina or previous MI.23 24 In fact, patients treated with statins who achieve LDL-c lowering of 2–3 mmol/L are expected to have a 40%–50% reduction in cardiovascular risk regardless of their baseline lipid profile.25 While the clinical benefits of statins have long been proven, contemporary imaging studies have nonetheless contributed important mechanistic insights revealing the multiple effects of statins on the arterial wall and atherosclerotic plaques. Collectively, these studies have demonstrated that treatment with statins can result in reduction of arterial inflammation, IMT, plaque volume and lipid content of the necrotic core, as well as a modest increase in angiographic luminal diameter and increased fibrous cap thickness and arterial macrocalcification contributing to plaque stability. 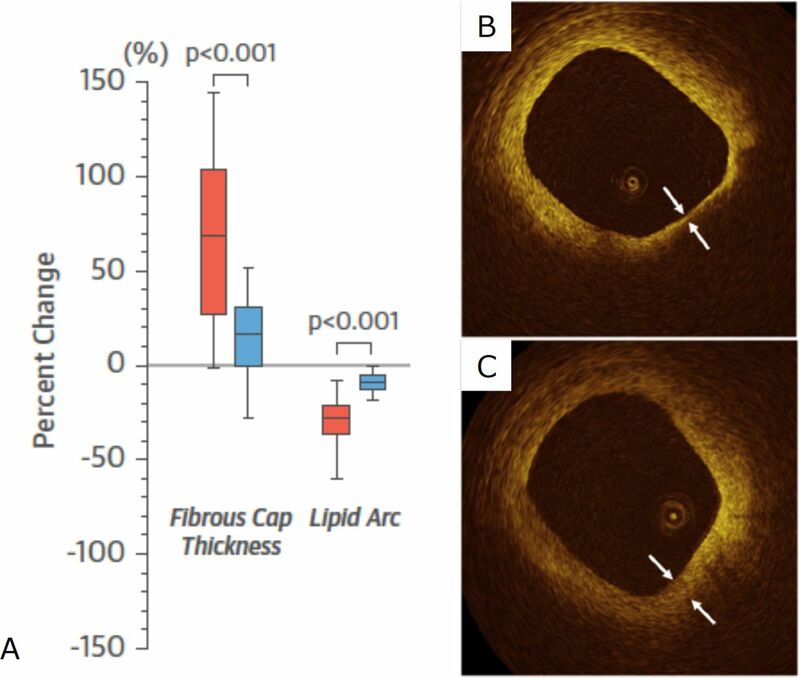 OCT imaging of fibrous cap thickening after statin treatment. (A) Graph showing per cent change in fibrous cap thickness and lipid arc measured by OCT in a study of 60 patients with unstable angina treated with atorvastatin 20 mg (red) or 5 mg (blue) for 12 months; representative OCT images from this study at (B) baseline and (C) 12 months showing increased fibrous cap thickness after treatment with atorvastatin. Figure adapted from Komukai et al. J Am Coll Cardiol 2014.44 OCT, optical coherence tomography. Effect of statins on T1-weighted MRI high-intensity plaques. (A) Graph showing significant reduction in T1-weighted MRI signal intensity in a study of 48 patients with coronary artery disease treated with high-intensity pivastatin compared with the propensity matched control group of patients with coronary disease not treated with statins; ( b ) representative image of a high-intensity proximal left anterior descending coronary artery plaque identified in this study using T1-weighted MRI, with ( d ) reduction in signal intensity after statin treatment; CTCA imaging of the same artery showing low-attenuation plaque and positive remodelling in the area of high-intensity on MRI (C) before and (E) after statin therapy showing reduction in plaque volume. Figure adapted from Noguchi et al. J Am Coll Cardiol 2015.52 CTCA, CT coronary angiography. As a second-line therapy for patients who are intolerant of statins or unable to achieve sufficient LDL-c reduction with statins alone, ezetimibe lowers LDL-c by reducing intestinal absorption of cholesterol. Ezetimibe has been shown to reduce cardiac events by a modest 2% compared with placebo when added to simvastatin in patients with acute coronary syndrome.56 This relatively small prognostic benefit compared with the large benefit afforded by statins might explain why imaging studies performed in patients treated with ezetimibe have shown somewhat mixed results. LDL cholesterol lowering versus IVUS-defined atheroma volume. 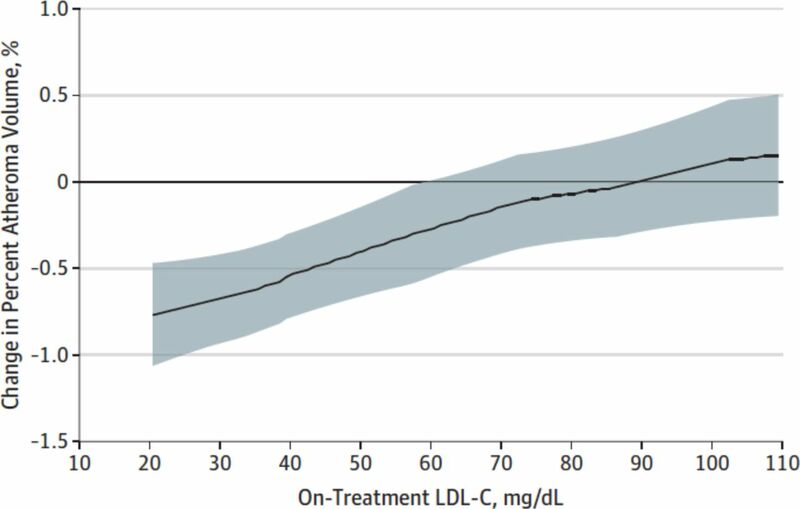 Graph showing correlation between low-density lipoprotein (LDL) cholesterol and percentage atheroma volume measured in drug trials using intravascular ultrasound (IVUS). 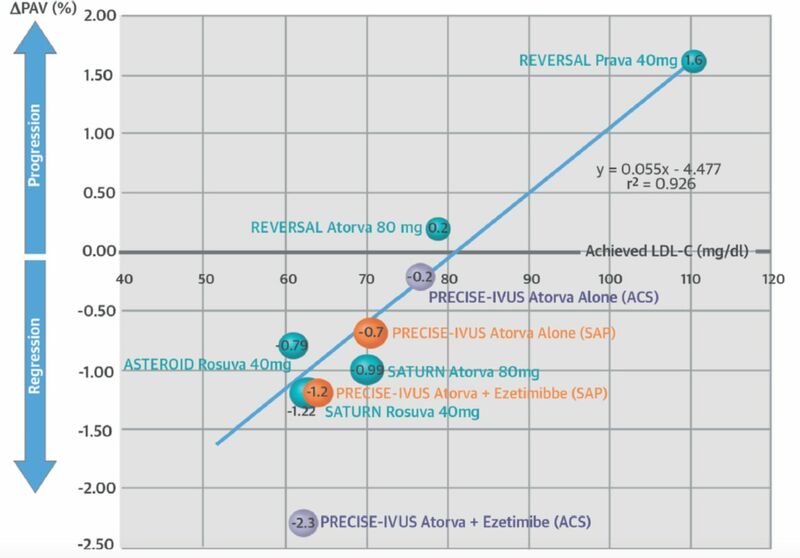 Figure from Tsujita et al, J Am Coll Cardiol 2015.59 ASTEROID, A Study to Evaluate the Effect of Rosuvastatin on Intravascular Ultrasound-Derived Coronary Atheroma Burden; LDL-c, low-density lipoprotein cholesterol; PRECISE-IVUS, Plaque Regression With Cholesterol Absorption Inhibitor or Synthesis Inhibitor Evaluated by Intravascular Ultrasound; REVERSAL, Reversal of Atherosclerosis with Aggressive Lipid Lowering; SATURN, Study of Coronary Atheroma by Intravascular Ultrasound: Effect of Rosuvastatin vs. Atorvastatin. Other cholesterol-modifying therapies tested using surrogate imaging markers include niacin and cholesteryl ester transfer protein (CETP) inhibitors (eg, dalcetrapib). While these studies mostly showed little or no beneficial effect on imaging endpoints, importantly, these findings predicted the negative results of the large-scale clinical outcome trials. The effects of the proprotein convertase subtilisin-kexin 9 (PCSK9) inhibitor evolocumab on coronary atherosclerosis has also been studied using imaging. Use of surrogate imaging markers to evaluate dalcetrapib. Graphs showing nominal changes in (A) arterial 18F-FDG inflammatory signals (7% reduction, p=0.08) in the most inflamed regions and (B) carotid total vessel area (4 mm2 reduction; p=0.04) in a double-blind multicentre trial of 130 patients randomised to treatment with the cholesteryl ester transfer protein inhibitor dalcetrapib (green dots) versus placebo (red dots). In a substudy of the same trial, (C) the difference in carotid 18F-FDG signal intensity between dalcetrapib (blue dots) and placebo (red squares) was more apparent in patients without carotid calcification (p<0.001). 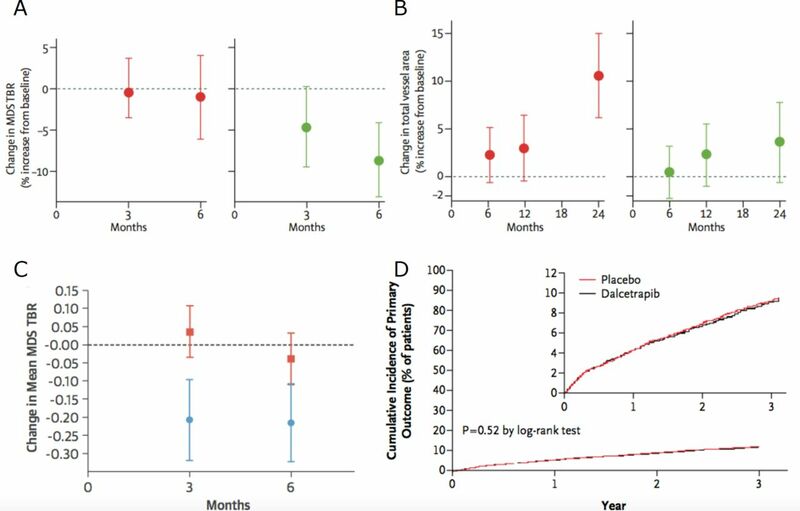 However, lack of data showing a clear, consistent effect of dalcetrapib on these surrogate imaging markers predicted its inability to reduce recurrent cardiovascular events in patients with acute coronary syndrome in a large clinical outcome trial; (D) graph showing similar rates of cardiovascular events for dalcetrapib versus placebo in this study. Figure adapted from Fayad et al. Lancet 2011 (A and B);73 Joshi et al. J Am Coll Cardiol 2016 (C);74 Schwartz et al. N Eng J Med 2012 (D).75 MDS TBR,Most Diseased Segment Target-to-Background Ratio. These modest effects coupled with little or no effect on all-cause mortality when applied to unselected patient cohorts,77 makes it difficult to justify the widespread use of expensive PCSK9 inhibitors. Indeed, the annual cost of a PCSK9 inhibitor (~$14 350) does not meet generally acceptable incremental cost-effectiveness thresholds.79 However, it is likely that higher risk cohorts would gain greater absolute clinical benefit, highlighting a potential role for imaging and other biomarkers to select those patients most likely to respond to treatment.80 Importantly, the Further Cardiovascular Outcomes Research with PCSK9 Inhibition in Subjects with Elevated Risk trial showed a significant reduction in cardiovascular events compared with placebo (9.8% vs 11.3%, p<0.001) in patients with atherosclerotic cardiovascular disease and raised LDL ≥1.8 mmol/L despite statin therapy.81 The ongoing A RaNdomized Double-blInd Placebo ConTrolled Study Characterizing THe Effects of PCSK9 Inhibition On Arterial Wall Inflammation in Patients With Elevated Lp(a), NCT02729025 study will determine whether evolucumab can reduce arterial inflammation measured by 18F-FDG PET in a cohort of patients with raised Lp(a) and LDL-c at baseline. For decades now, we have known that atherosclerosis is an inflammatory condition and not merely a disease of lipid dysregulation. Local and systemic inflammatory networks fuel every stage of the disease process from initial lesion formation, to the progression, destabilisation, rupture and healing of advanced atherosclerotic plaques.82 Accordingly, a new wave of anti-inflammatory therapies are in development for the management of atherosclerosis targeted to a range proinflammatory pathways and mediators. In several instances, imaging has proven useful as an early marker of drug efficacy, or lack thereof, and again, it holds promise in identifying the patients most likely to benefit from these expensive or potentially toxic treatments. Several disease-modifying and biological agents currently used for the treatment of chronic inflammatory diseases might be useful for treatment of atherosclerosis, including methotrexate, colchicine, tumour necrosis factor-α (TNFα) inhibitors and rituximab. Intriguingly, in a prospective controlled study of patients with severe psoriasis treated with anti-TNFα therapies or the interleukin (IL)-12/IL-13 inhibitor ustekinumab, these anti-inflammatory therapies halted progression of CAC score but not luminal narrowing assessed by CTCA over a 13-month period.83 Anti-TNFα therapy has also been shown to reduce arterial IMT in patients with psoriasis who did not have calcified atherosclerotic plaques84 and reduce aortic 18F-FDG inflammatory signals in patients with rheumatoid arthritis.85 In another study of 55 women with rheumatoid arthritis and without overt cardiovascular disease who were treated with rituximab, a monoclonal antibody to CD20 on B cells, a significant 9% reduction in carotid IMT was seen in those patients whose arthritis also responded to treatment.86 A prospective study of rituximab in patients with ST elevation MI is ongoing (NCT03072199). Canakinumab is a human monoclonal antibody that inhibits IL-1β, a cytokine central to the acute inflammatory response that drives the classical IL-6 pathway. In a study of 189 individuals with atherosclerosis and type 2 diabetes mellitus or impaired glucose tolerance, there was no significant difference in mean carotid wall area on MRI observed after 12 months of drug treatment compared with placebo, despite measureable effects on hsCRP and IL-6.96 However, in a clinical outcome trial including 10 061 patients with previous history of MI and hsCRP >2 mg/L treated with canakinumab in addition to usual therapy, there was a significantly lower incidence of recurrent cardiovascular events compared with placebo.97 Further work is needed to fully evaluate the role of this, and other, anti-inflammatory drugs for the treatment of atherosclerosis. While we have many imaging strategies that can be applied as surrogate markers of drug efficacy, none of these methods can surpass the benchmark of a clinical outcome trial. However, imaging can be used to elucidate mechanisms of action and directly quantify specific drug effects on the arterial wall and atherosclerotic plaques. As we begin to see the clinical introduction of a range of novel antiatherosclerosis therapies to treat the many patients with so-called residual lipid or inflammatory burden, imaging can be used to help fast-track those drugs most likely to have a real clinical impact into large-scale phase III trials and to avoid wasting vast resources on drugs that have no measureable effect on any of the established markers of disease severity. The use of imaging in clinical cardiovascular drug trials can impart valuable insights into underlying mechanisms of action and early evidence of drug efficacy to improve the efficiency of subsequent clinical outcome studies. Measurements of plaque burden are among the most useful surrogate imaging markers in cardiovascular disease, as this marker exhibits the strongest relationship with hard clinical outcomes. However, as modest changes in plaque burden occurring in response to lipid-lowering therapy do not match the large reductions in clinical outcomes observed in randomised trials, other mechanisms related to plaque composition and inflammation should also be considered for use as surrogate endpoints. Imaging endpoints cannot replace the need for large-scale clinical outcome studies to evaluate the true clinical value and safety of a new drug. Imaging studies have demonstrated that statins can dampen arterial inflammation, induce plaque regression and exert stabilising effects on plaque morphology and the degree of coronary macrocalcification. Imaging has also been used to test the effects of other cholesterol-modifying therapies, as well as anti-inflammatory therapies, on the arterial wall and atherosclerotic plaques. Education in Heart articles are accredited for CME by various providers. To answer the accompanying multiple choice questions (MCQs) and obtain your credits, click on the ‘Take the Test’ link on the online version of the article. The MCQs are hosted on BMJ Learning. All users must complete a one-time registration on BMJ Learning and subsequently log in on every visit using their username and password to access modules and their CME record. Accreditation is only valid for 2 years from the date of publication. Printable CME certificates are available to users that achieve the minimum pass mark. JMT is supported by the Wellcome Trust and the National Institute for Health Research. MRD is supported by the British Heart Foundation. JHFR is supported by the British Heart Foundation, Wellcome Trust, National Institute for Health Research Cambridge Biomedical Research Centre, Higher Education Funding Council for England and the Engineering and Physical Sciences Research Council.
. Effects of lipid-lowering by simvastatin on human atherosclerotic lesions: a longitudinal study by high-resolution, noninvasive magnetic resonance imaging. Circulation 2001;104:249–52.
. Effect of the PCSK9 inhibitor, evolocumab, on the composition of coronary atherosclerosis: Insights from the GLAGOV trial. European Society of Cardiology 2017. Contributors JMT wrote and edited the article. MRD and JHFR reviewed and edited the article. Author note References which include a * are considered to be key references.